As we near the finish of our New Zealand season, the snow depth has once again been replenished although this has made for some interesting spring conditions for training! Following on from the National Championship races at Coronet mid August, we headed over to Australia for the first of the ANC cup races at Mt Hotham. Blizzard conditions meant day 1 was cancelled and with almost two metres of snow on piste, the conditions were really soft and and I found it quite difficult getting decent turns. While not the results I was aiming for, I did get some of my best results in Hotham. 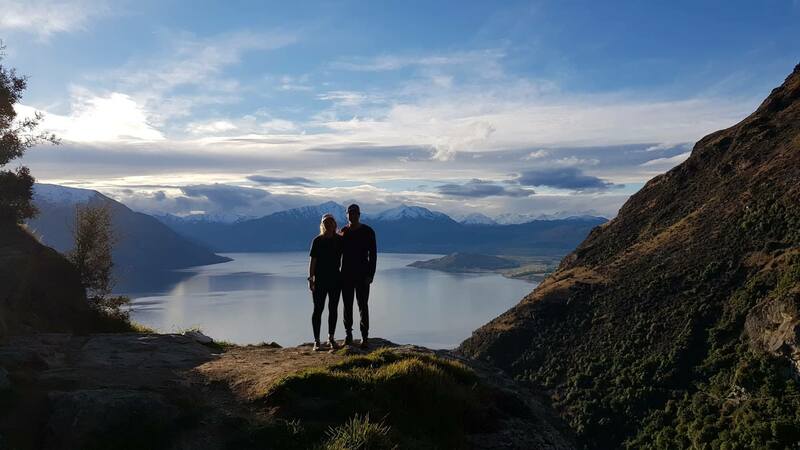 With needing to use the weather day it meant that it was a rush trip from Hotham back to Queenstown and straight into racing the following day for the NZ portion of the ANC series. Bit of a mixed bag of skiing with some great sections of racing but the snow was quite soft and slushy in parts which broke away. Not quite enough training to get the full feel for my new equipment yet, but really enjoying the new Volkl, Dalbello and Marker set-up so far with just a few adjustments to make. A couple of days off snow then it was off to Methven for racing at Mt Hutt with blizzard conditions for the start of what was to be the Super G races. This meant that the first two days were cancelled and we had three super g races on day three, 5th September. Soft conditions made for some frustrating results but I came away with 2nd in National Champs SG with team mate Willis taking out 1st place. This also rounded out my ANC cup results to win the overall yellow bib. Final races for the season were on the 7th September at Cardrona where we had two giant slalom races on the one day and I picked up two silver medals.The more gentle slope and soft snow are unforgiving with any mistakes and a good line is important. This morning we woke to a good 20-30cm of fresh snow on the ground which was nice to see on our day off. Today has mostly been spent watching the world cup Slalom in Levi, tuning skis and some recovery gym work. Below is a little footage of some of the training we have had over the past week. 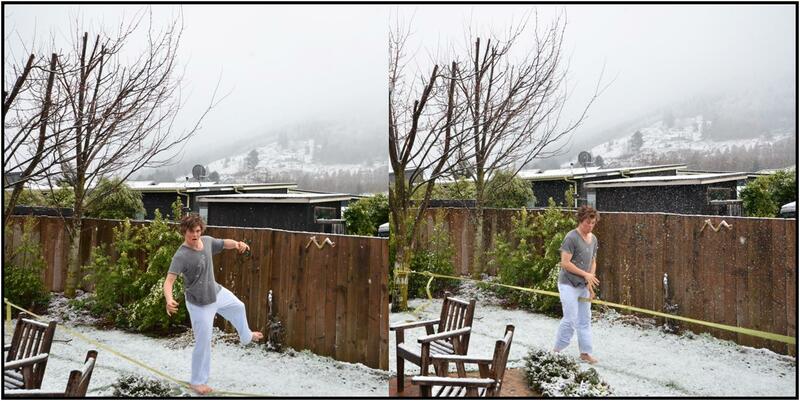 It finally decided to snow yesterday as you can see in the picture with my team mate Sam Roberson getting in some slack-lining practice.. And today it was back around 14 degrees and sunny! Up the mountain it was a good day though with some morning Super-G free skiing in preparation for Mt Hutt in just over a weeks time then some GS gates later on. Our next race is an ANC GS at Cardrona on the 9th. Hopefully some good results to come from that! Then we will continue up to Mt Hutt for the ANC finals and National Champs Super G.
The ANC Winter Games has come to an end. It was a tough series with a top group of athletes. 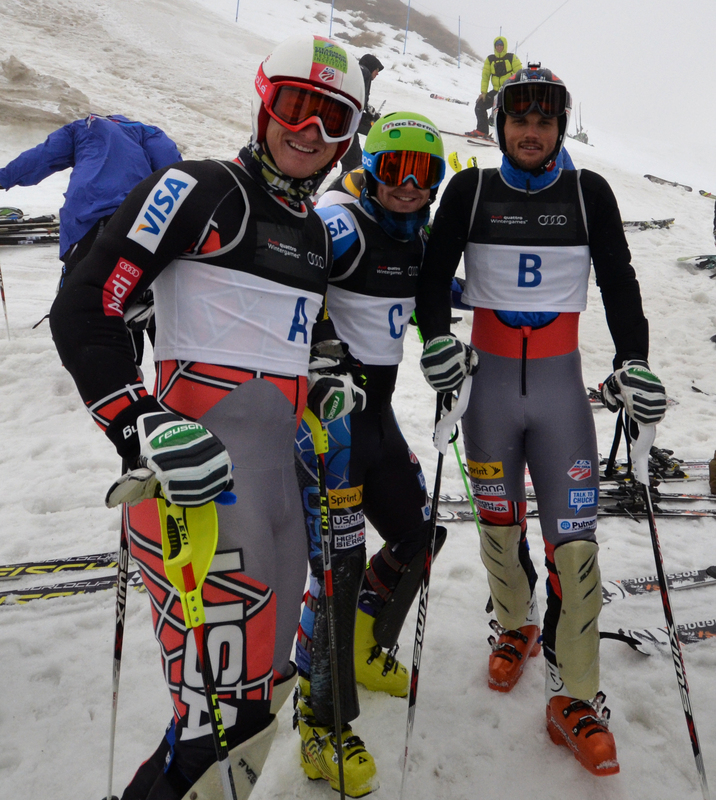 Picture of Tim Jitloff, Nolan Kasper, and Thomas Biesemeyer forerunning the Mens Slalom up at Coronet Peak. I didn’t make FIS points but did manage to get some ANC points which will help towards a good start position at Mt Hutt later in the season. 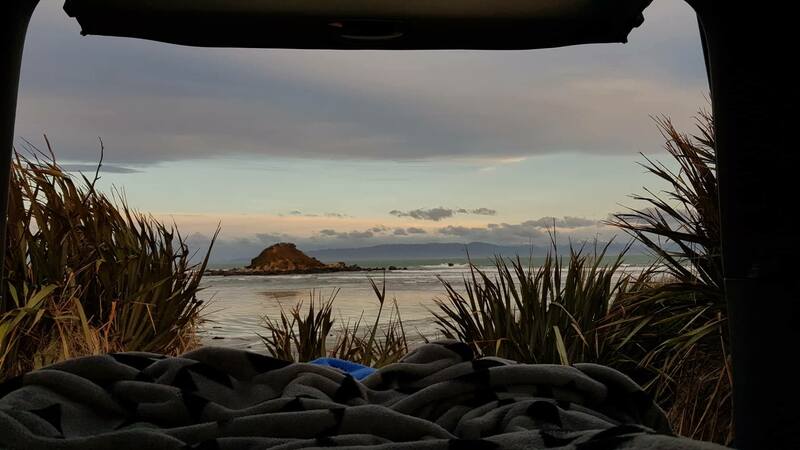 There has been some good training lately despite the lack of snow and hopefully we will be racing Nationals on the 29th and 30th also up at Coronet Peak.